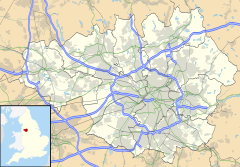 Historically a part of Lancashire, Ainsworth was formerly a chapelry in the parish of Middleton and hundred of Salford. It was added to the Radcliffe Urban District in 1933. Author and ghostwriter Paul Stenning is a former resident and pupil of Ainsworth County Primary School. ^ Gastrell, Francis (1849). Notitia Cestriensis: or Historical notices of the Diocese of Chester. 19. p. 105.